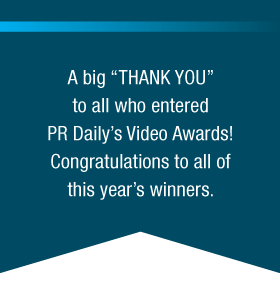 Congratulations to the winners of PR Daily’s 2015 Video Awards! We asked to see your best business videos. And our faith in your imagination, in your humor and wit, in your consummate professionalism was justified by a flood of top-flight entries. The PR Daily staff would like to thank everyone who shared their work with us. We can only imagine how many hours of brainstorming, taping and editing went into your work. Your creativity, resourcefulness and skill confirmed our high expectations for business video and set the bar high for next year.